Having only recently developed a mildly green thumb, my appreciation of gardening has grown exponentially over the past two years since starting my own patio container garden. With a very shady north-east patio, my choices are limited to impatiens, lobelia, and the odd coleus, not the more showy sun-loving blooms like roses or geraniums. 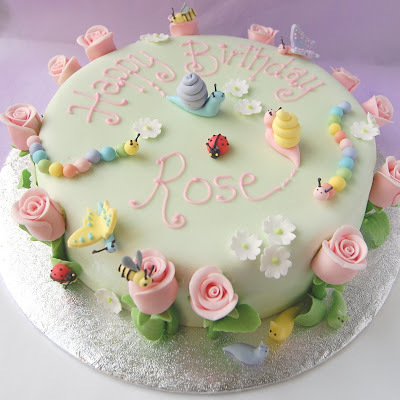 This week, my gardening moved indoors and to the kitchen specifically, in order to create a rose garden themed birthday cake for a lucky one year-old named Rose. All the pink roses, white impatiens, foliage, and garden creatures were made from fondant, with small royal icing details. I could (and did) sit happily for hours without interruption shaping a whole menagerie of creatures and bouquet of roses, work that some people would find tedious. There is a meditative quality to this type of repetitive fine detail work which suits me. The entire cake experience was not all rosy, however. Because the fondant roses were meant to lie flat against the side of the cake, I had shaved off the back of each rose and assumed they would adhere easily with either Tylose glue or stiff royal icing. Neither worked because of the fondant rose's weight against gravity causing them to fall off one by one, injuring some garden creatures in the process. Ultimately, I had to skewer each rose with a toothpick and secure them directly into the cake with great reluctance. Despite the rose drama, this rose garden cake might be my favourite cake yet. My favourite details include the snails and their tracks becoming the writing, the inconspicuous family of slugs, and the rainbow caterpillars. Such a high degree of cuteness all packed into one cake! Posted by Charmaine at 11:48 a.m. This is such a darling cake! I love it! July 21, 2008 at 2:09 p.m. This is such an amazing cake! I love it! July 21, 2008 at 8:54 p.m.
July 22, 2008 at 12:01 a.m. This is such a sweet cake. I had fun looking at all of the details. I love how the snail wrote Rose :) Fabulous Job! July 22, 2008 at 4:29 a.m.
Wow, have you got talent! That cake looks amazing, you did a beautiful job! July 22, 2008 at 6:23 a.m.
this is one beautiful cake! Love the pastel color and the garden theme. Just curious, how long did you spend decorating this cake? July 22, 2008 at 7:22 a.m. Absolutely adorable! Love your creation. July 22, 2008 at 8:42 a.m.
love the adorable little bugs :) wow, never thought i'd ever say that. July 22, 2008 at 9:42 a.m. Darling cake. I love it. You have such talent. July 22, 2008 at 9:52 a.m.
July 22, 2008 at 10:15 a.m.
Il est magnifique, j'aime beaucoup ! July 22, 2008 at 10:17 a.m. This is gorgeous. If only I had were so talented. You do great work! July 22, 2008 at 11:27 a.m.
Wow, that's so cute! great job! July 22, 2008 at 1:00 p.m.
my granddaughters (they are 3 and 6 yrs old) and i were snuggling together looking at your beautiful cake and picking out all the little butterflys and bees, they thought your cake was wonderful! I have tagged you for a meme, come to my blog and find out how to play. July 22, 2008 at 1:56 p.m.
That is possibly the cutest cake EVER. What a lucky little girl! I don't think I could bear cutting into it, though! July 22, 2008 at 2:57 p.m.
this is quite possibly the cutest most perfect cake I have seen! Your attention to detail is outstanding! July 22, 2008 at 3:48 p.m.
July 22, 2008 at 4:36 p.m.
Mandy: I don't remember how long it took (it's all a blur) but if I had to guess, the flowers took a whole morning, the bugs the whole afternoon + evening, and from covering the cake to the very last touch, probably 4-5 hours (would have been shorter if the roses cooperated)...all spread out over 3 days. July 22, 2008 at 6:37 p.m.
July 22, 2008 at 9:22 p.m. I love this adorable cake!! The rainbow caterpillars are my favorite...too cute. You have such talent for the darling details! July 22, 2008 at 10:17 p.m.
July 24, 2008 at 4:12 p.m. This is the loveliest fondant-decorated cake I have ever seen. August 8, 2008 at 9:14 p.m.
Beautiful cake! as a new cake hobbiest, I sincerely appreciate how much work went into this cake. I'm sure Rose was very pleased! August 29, 2008 at 9:05 a.m. Absolutely darling - I love it!!! February 25, 2009 at 2:09 p.m. I was just wondering what you made the antennas out of? I'm gonna make this for my daughters 4th birthday. It's so adorable! August 12, 2011 at 9:44 p.m. Anonymous: the antennae were made from piped royal icing that i left to dry out but i actually wouldn't recommend that. it was a big pain and kept breaking. August 13, 2011 at 9:14 a.m.